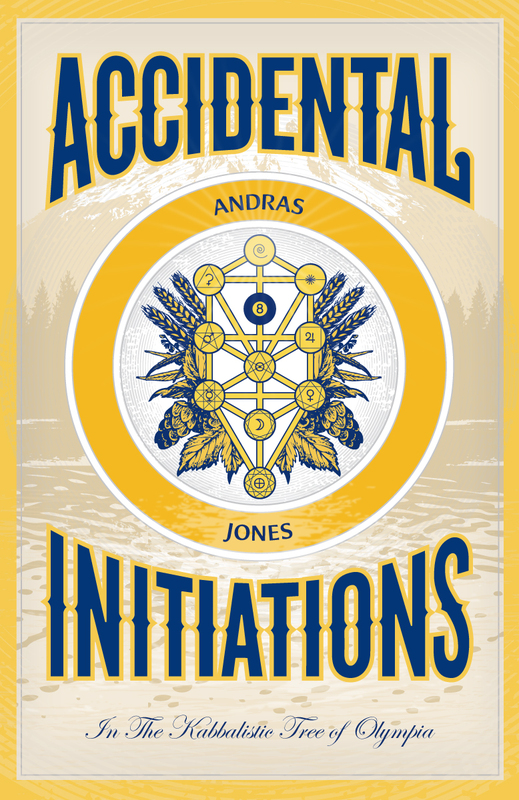 I’ve been looking for evidence that Olympia’s heart is opening as a result of, or at least coincidental with, my work in Accidental Initiations. A couple of days after posting The Tipareth Gazebo is Open!, I was invited by my friend and sometime collaborator, Scott Taylor, to come out to Hannah’s and see his open mike set. Just getting this invite, and feeling inspired to accept it, was a sign of something shifting. I’ve been a hermit at The Martin for several years now and almost no one ever calls and asks me to come out on the town anymore. I know it’s mostly because they think I’ve moved. That’s what KAOS told people about why Radio8Ball isn’t on the air. Since I don’t play or put on shows like I used to, and most of my Facebook posts are about bartending gigs I’ve picked up in Seattle, people just assume that I’m gone. In a way, I have been. I am. Real gone, man. So, when I walked into Hannah’s (late for Scott’s set – Damn!) several people came up to ask when I got back to town. One of these was an old friend: Lee Brooks. I know Lee from back in the days when my band, The Previous, lived in a house near Lincoln Elementary with me and my wife. I first remember Lee from the Washington Hemp Education Network. He was a high-energy, high integrity, pothead, activist, musician from way up yonder in the land of the Yukon Thunderfuck, and we all became friends in the easy way that young people do. He’s always been cool with me. Not in a furtive, cooler-than-thou manner, but in a welcoming loving way I was glad to see hadn’t diminished over the years, as if Olympia’s hipster kryptonite simply doesn’t have any effect on him. 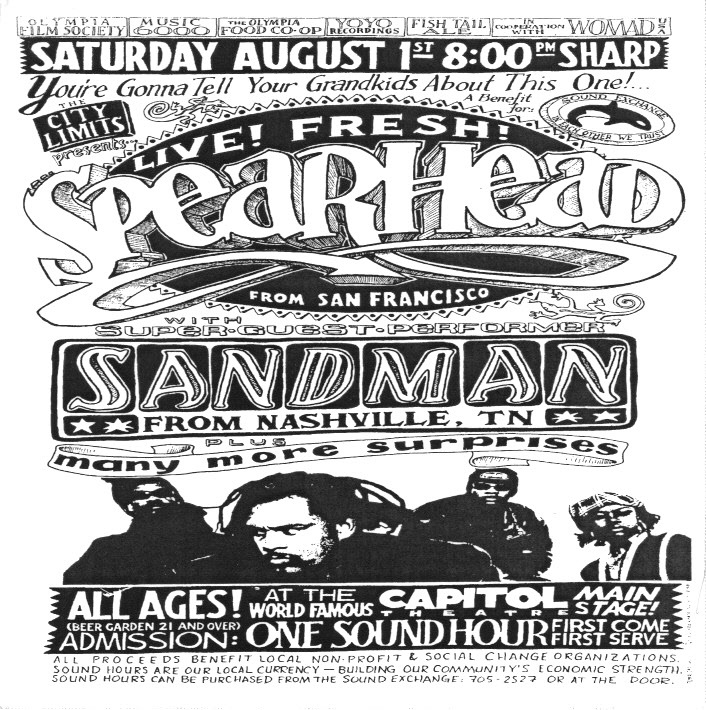 When Lee recognized me at the bar he came up and, with great authenticity and emotional intensity, shared some remembrances of the Spearhead Sound Hours benefit he helped me and Heidi organize at The Capitol Theater in August of 1998. It was a moving challenge; allowing his honorable words to penetrate my jaded heart, but as I recount in AI, I have some training in heart opening so I used my practices and received Lee’s glowing reflections the best I could. I was warmed by his manly tears and, as I surrendered to the moment, the experience activated the time portal of memory. 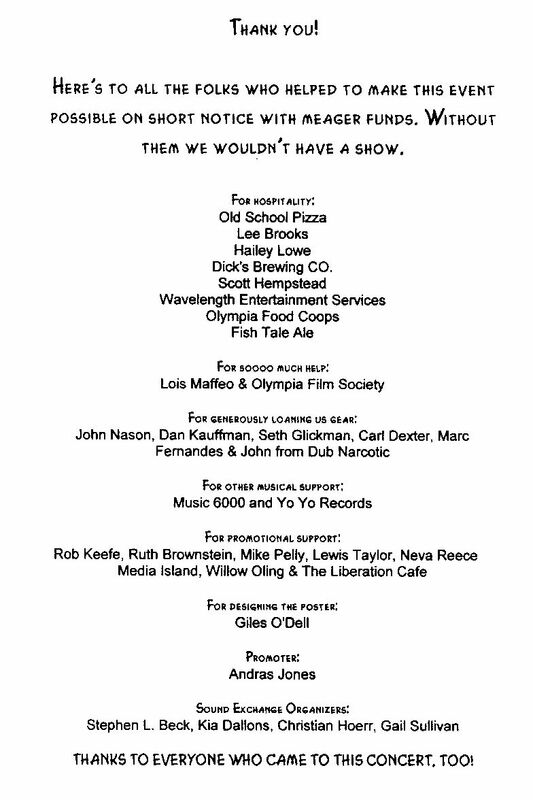 The Spearhead Sound Hours benefit at the Capitol Theater was probably my purest offering to Olympia. Inspired by Ithaca, New York’s success with local currency, I was working with the Oly’s alternative currency activists to get a program started here. 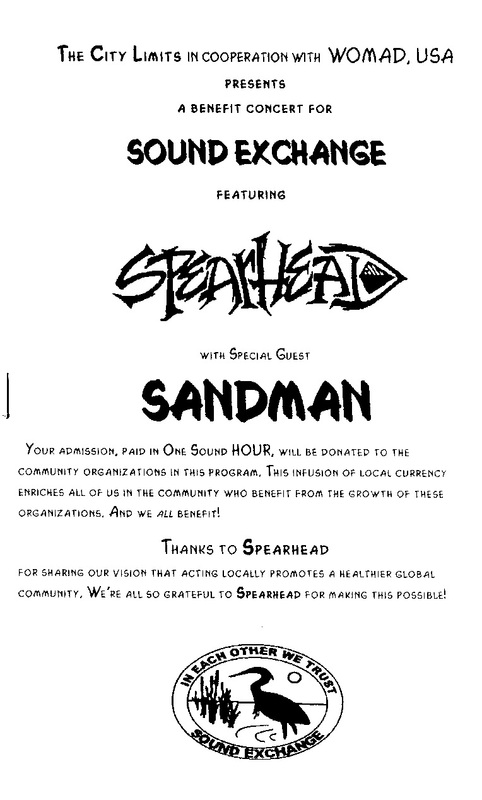 When I heard that Spearhead was going to be in the area for WOMAD (Peter Gabriel’s world music festival,) I reached out to see if they would be interested in performing at a benefit. I knew the band because we had shared the same music management a few years earlier. Michael Franti was a supporter of local currency and they said, if we could cover the gear, the transportation from Seattle, and hotel rooms in Oly, they would play the show FOR FREE. This was a major coup, which led to Spearhead coming back to Olympia several times over the next few years. 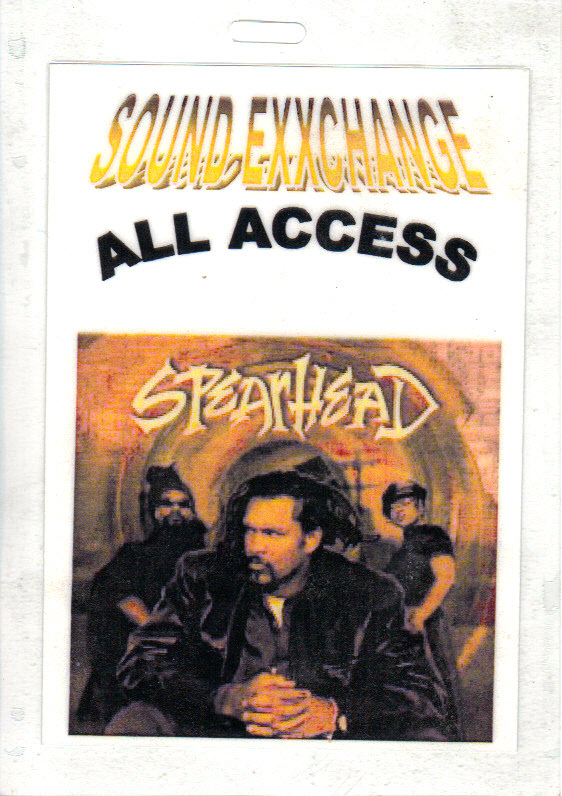 In the late 90’s Spearhead was one of the coolest bands on the west coast, even more so in our queer/punk/hippie/activist, and mostly white, community. This show drew participation across the board. The whole design of the event, where people had to buy their ticket with local currency, gave the weeks before the show a scavenger hunt feel with people trying to earn or purchase their Sound Hours. I tabbed Lee, with his good time attitude, to be the artist liaison. This meant driving the band from Seattle and making sure they were taken care of while they were in Olympia. Being the highly social animal that he is, Lee had a blast in this role and, at Hannah’s this week, he told me that his Spearhead experience was the beginning of becoming a music producer and promoter which, it turns out, has become his main gig. This made me feel really good to hear. As I go back over the show’s artwork I am struck by how much I kept myself out of the promotion. It was clearly my gig and I could, maybe should, have been the opening act, or presented the show as being produced by me or my company. Instead I took it on, as I would later learn to think of it, like a Landmark Education project with the goal being: to touch, move and inspire the most people and enroll them in the possibility of sustainability, music, community, and my ability to mix them all in a magickal container of invisible ritual at The Capitol Theater. I was fully engaged in my role as servant to this enterprise and, if I remember correctly, there was nothing particularly humble about the way I took it on. I simply knew that, in order for this magick to work, it needed full participation from the community. It was a gift. A mitzvah! And I did, indeed, get more out of it than almost any other event I’ve produced, though not exactly as I might have imagined. I just ran into Lee again. He shared one other interesting anecdote about The Spearhead Sound Hours benefit which relates directly to Accidental Initiations. It turns out that, because of Lee’s role as a producer on our event, he was able to attend the WOMAD festival as a guest of Spearhead. At one point in the festivities Lee found himself in the possession of two backstage passes. He gave one to Ruth Brownstein aka Ruby Brown. With this access, Ruth was able to get backstage and interview Michael Franti. According to Lee, this interview got Ruth’s foot in the door at The Mountain, a big commercial station in Seattle, and eventually, to her current job as the training and operations manager at KAOS. Funny how things work out. As related in Accidental Initiations, in her official capacity, Ruth wound up playing a major role in killing Radio8Ball on KAOS. One must be a true connoisseur of synchronicity to savor the delicious irony of syncs such as this. The only way I know how to do it is to breathe it into my heart, run it up and down my Tree, laugh about it, and share my story with you. This entry was posted in Alternate Currency, Kabbalah, KAOS, Olympia, Synchronicity and tagged Hannah's, Heidi Love, Kabbalah, KAOS, Landmark Education, Lee Brooks, Michael Franti, Ruby Brown, Ruth Brownstein, Sandman, Scott Taylor, Sound Hours, Spearhead, synchronicity, Washington Hemp Education Network. Bookmark the permalink.